Incapacitating Chemical Agents – Blurring the lines. This week, the Organisation for the Prohibition of Chemical Weapons hosts the Conference of State Parties. This event brings together national representatives from all over the world, in order to ensure the implementation of the ban against the development, stockpiling and use of chemical weapons. As was noted on the first day, in light of the recent atrocities in Syria, the responsibilities of those party to this convention also extends to the destruction of chemical weapon stockpiles as well as the support and treatment of victims of chemical weapons. This year, there is a significant attention from NGO groups to the issue of Incapaciating Chemical Agents or ICA’s. ICA’s are typically anaesthetic and sedative drugs, often delivered via aerosol, designed to render humans unconscious. The route of action in generally via the central nervous system, which means that the difference between subduing and killing is a matter of dosage. It has already been tragically demonstrated that controlling dose levels in operational contexts is practically impossible. In the Moscow Theatre Hostage Crises in 2002, Russian security forces used an unknown aesthetic gas to subdue the hostage takers. The use of the agent resulted in the death of over 120 the hostages. Concern about ICA’s is not limited to direct and long term impact of the use of these weapons on human health. There is also concern that the development and development of these weapons by states also has the potential to undermine the norm against the use of chemical weapons in armed conflict. This is often termed a ‘slippery slope’ type argument, which is an approach to argumentation which is associated with a tendency to focus on bad outcomes, and ignore the intervening steps that lead to the outcome. Such concerns are not farfetched however. For example, currently the question of what counts as ‘legal law enforcement’ in a situation where civil disorder borders on , and then turns into civil war, seems particularly challenging. Such ambiguity potentially has destabilising effects on local, regional as well as international norms against the development and use of such weapons in military contexts. ” The international community’s response to advances in weapons-related science and technology has often been inadequate and late, introducing partial and ineffective controls (if any are introduced at all) long after a new weapons technology has spread to and been employed by State and non-State actors. With the issue of ICAs – because proliferation has been relatively limited – there is still time to act. 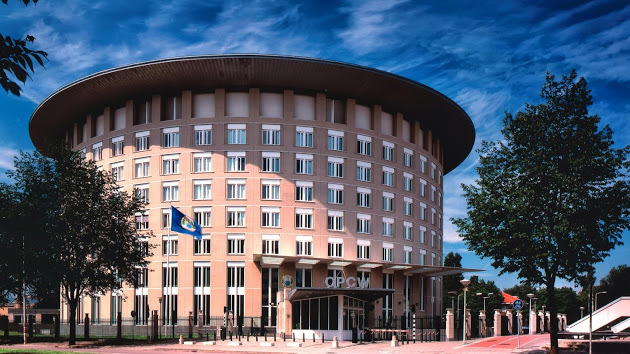 There is now an opportunity for the OPCW to take a precautionary and preventative approach, and address the development and use of ICAs and related means of delivery. If the OPCW does not do so in the near future there is a danger that advances in relevant scientific disciplines together with current and potential future State research and development into ICAs and related means of delivery may lead to proliferation and misuse of such weapons. (e) Utilise the Biological and Toxin Weapons Convention (BTWC) inter-sessional processes to explore science and technology developments of relevance to ICAs and related means of delivery. (c) Explore the implications of convergence in the life and chemical sciences for the development of ICAs and related means of delivery. Likewise, the ICRC has also produced a position paper (available here), which in part draws upon an Expert meeting held in Montreux, Switzerland in April 2012 ( report available here). While there has been attention as well as support for addressing ambiguity around ICA’s, such as at the previous review conference, there has been little progress in terms of agreements. With this in mind it will be interesting to see the extent to which States Parties make moves on this issue in the run up to the next review conference.